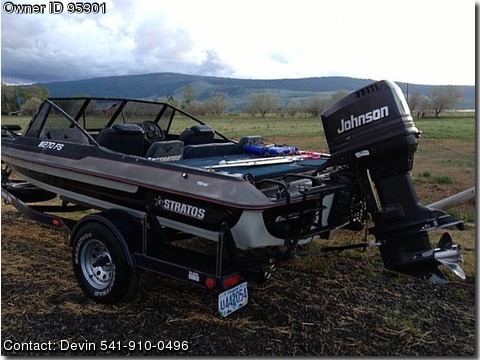 Call Boat Owner Devin 541-910-0496. Description: 1994 - 17.5' 270FS Stratos Fiberglass 1995 - 150 Johnson Outboat motor, new 2006 Motorguide 48 Volt Hands Free Tolling Motor, Livewells, Platform, wired for depthfinder, Seating for the Fisherman, AM/FM cassette, anchor, Coast Guard pack, new 2008 carpet, bilge pump, full gauges, SS prop, spare prop, storage, 3 batteries, 3 bank onboard battery charger, Skies & Tow Rope for the Water Lover. Matching single axle trailer w/ new tires, Prof. maintained Asking $9500. Text 541-910-0496 if you have any questions or would like to see it.